Shrinking Wallet: Check out these giveaways! I love winning giveaways, especially when I'm on a spending ban... Please check out these giveaways for a chance to win some amazing prices. Christine and MUA have teamed up to give away MUA products, including the ever so popular Undressed Palette, famously known as the Urban Decay Naked Palette dupe. This giveaway ends July 23 2012, and is opened worldwide! Click on the image below to enter! 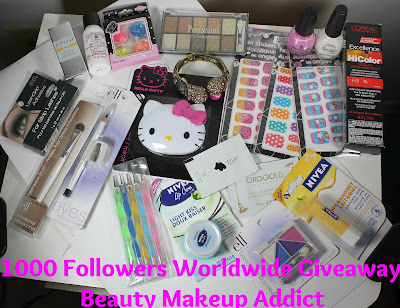 The next generous giveaway that is opened worldwide is by beauty makeup addict. 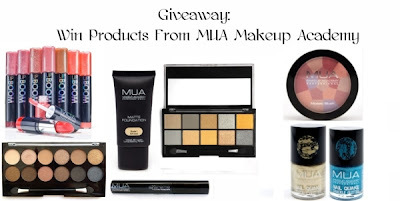 She is giving away a whole heap of nail and makeup products! This giveaway ends September 16 2012. Click on the image below to enter! 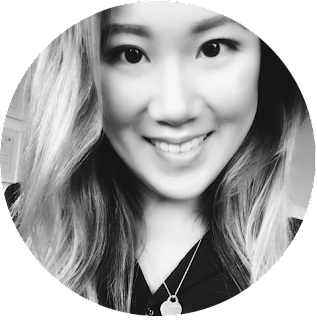 There will be three winners in this giveaway by Jessica. If you're a nail polish addict, you'll love this one! There are a whole heap of nail stuff to be won. This giveaway ends August 2 2012 (the same date as mine!) This is also opened internationally. Please click the image below to enter. NOTD: Possibly my best manicure ever! I love presents from the postman!